So my flight back to Amsterdam is on the 28th and my Thai Visa ends on the 27th… Good Job! But we had bigger fish to fry, I was under the impression that rocking up on an airport and claiming the last two seats on a flight would be cheap. At least that’s why they call it last-minute right?!? Skyscanner might give you cheap fares, but surely if you are the person to fill up the aircraft to the brim it should be super cheap? If boarding closes in 10 minutes, and it’s still not sold online who’s gonna buy it? Turns out that’s dead simple. 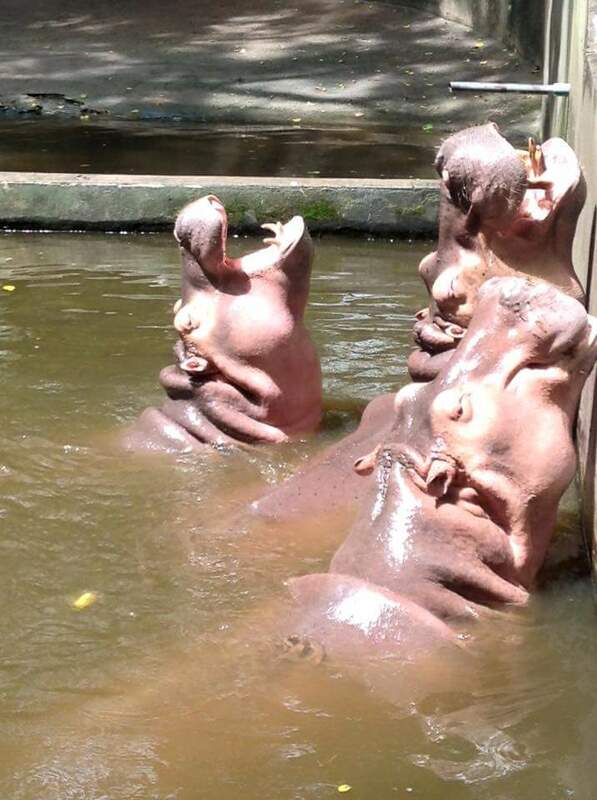 Just walk to the ticket office at the train station and buy two overnight tickets to Chiang Mai. Luckily the station staff was really friendly and helpful and made sure we were standing in the right spot. Then the train arrived, looked much more modern than i expected and we made it to the right carriage. Just need to find our seat/bed numbers and we are golden! Oh wait… Our bed is taken?!? This french girl sleeping had to get OUT of our bed right now it seems! There seemed to be a misunderstanding between the conductor and the Frenchies, who asked if there where any more stops on the line. The french dad was very happy with that so his daughter didn’t have to scurry out of bed. After we settled in and the catering service took our order for two hot coffee in the morning… we stated watching a movie. After the movie we where too tired to move and we fell asleep fully clothed. We arrived at the Dutch Guest House around 8, and we were very delighted to hear that there was a free room available instantly. So we could take a shower. After that headed for breakfast. The best breakfast in Chiang Mai is at L’Opera, a French bakery actually operated by French owners. Who seemed to refuse to have learned Thai and/or English. But who cares… they also refused to make the bread and pastries anyway else than is accepted in France. Super small hipster, hippy, yoga-pants, stoner town. full of cafes and restaurants. Not much to do here except eat, eat and eat. A visit to Pai Canyon is worth the drive, you can also visit some hot springs although we didn’t bother as it was ball-sweating hot most of the time. We did take a dip in one of the refreshing waterfalls around Pai… but mostly we filled our bellies to the brim! Really relaxing atmosphere and easygoing town. A recommendation for any traveler going up north. 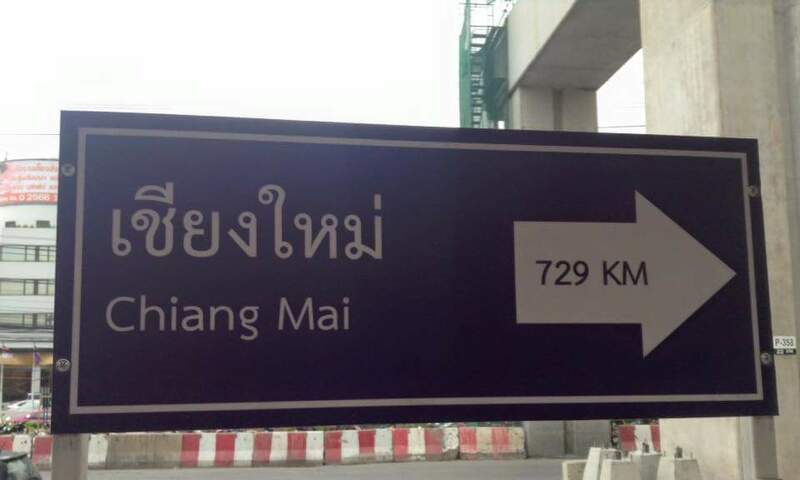 To get to Chiang Rai from Pai you’ll have to backtrack to Chiang Mai again. and so the day was filled with 3 hour of driving back to Chiang Mai. Then a two hour overlay while getting some lunch, and another 3h drive up to Chiang Rai. 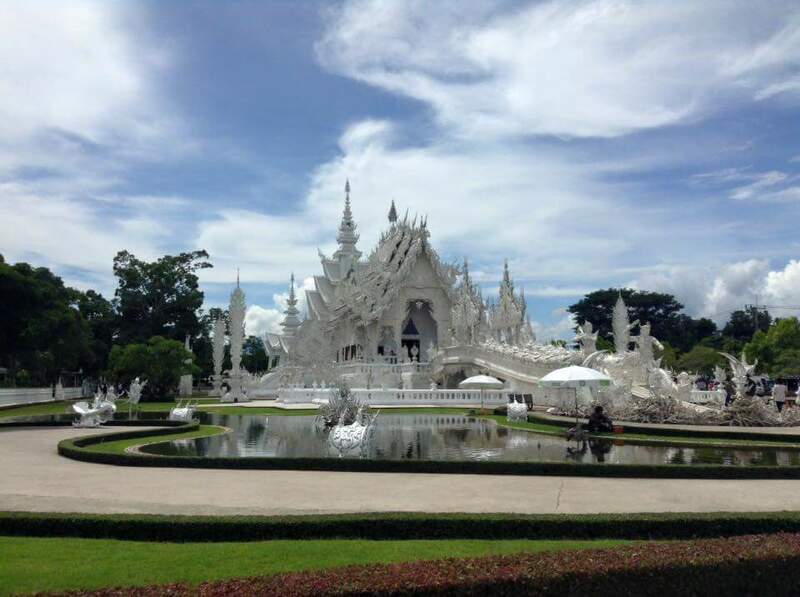 The White Temple… a super big attraction in Chiang Rai. 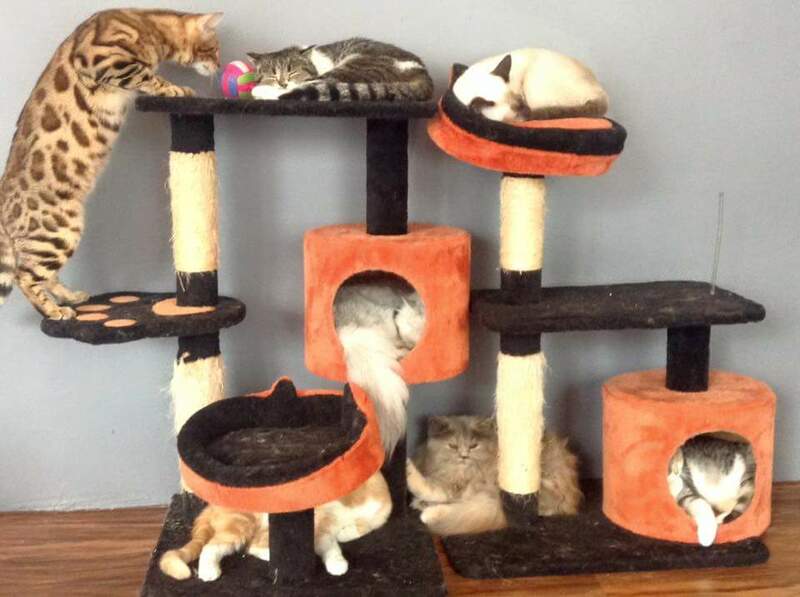 The Cat Cafe (Cat N a Cup) is a recommendation for everyone who loves cats. Also it turned out that Pokemon Go (The popular augmented reality game) was just released in Thailand. Everyone seems to be totally into it, we even spotted a few monks playing the game! Currently (8-AUG-2016) we are on our way to Sukothai to see the best preserved ruins in Thailand. But stitting for 6 hours on a bus does get your bottom feeling a bit like a rock. 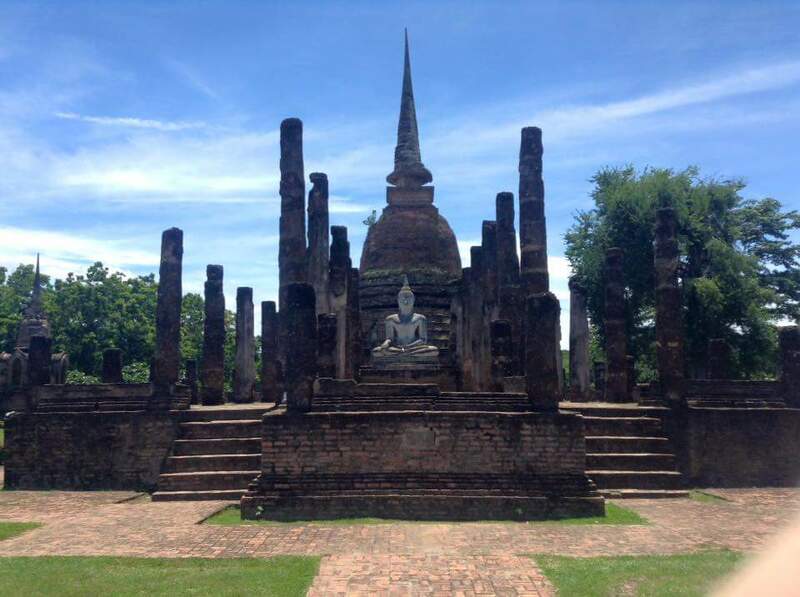 Sukothai was hot, but a visit to the historical park is worth it!